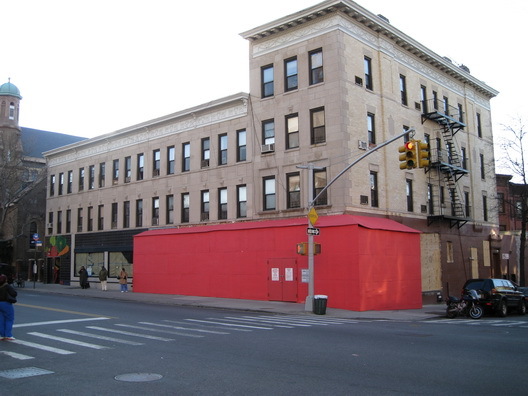 The temporary wooden front at the former D'Agostino's/Gothic Cabinet Craft space at Seventh Avenue and Sixth Street has acquired a coat of red paint. As we first noted last April, part of the space is becoming a branch bank. At the time, we were told it would be a Bank of America. The identity of the new bank hasn't been revealed, but there is only one bank that we know that uses a red color scheme: Bank of America. Unless the red paint is a coincidence or they couldn't get standard issue construction fence blue because the paint store was out. There is no work going on in the other one-third or so of the space, and a "for rent" sign is still in the window. Brookbit: Action at Court Street Blockbuster?